Wonton noodles or wantan mee is a popular Cantonese noodle dish which is a very simple noodle dish served in a hot broth garnished with wonton dumplings, meats and vegetables. This dish is not just popular in China but in Malaysia, Singapore, Thailand, Philippines and Hong Kong as well. The variation of each location is minimal and mostly it varies only with the vegetable used and the additional meats. Commonly they use thin egg noodles but others use rice noodles or thick egg noodles. In Hong Kong the most common way of serving this is only with wontons and leafy vegetables, some establishments even serve this deconstructed meaning everything is in separate bowls. In Malaysia and Singapore thin slices of char siu are added, some other variations are spicy and some even used deep fried wontons in replacement for the boiled ones. In Philippines it is a bit different as there are also several versions and the most popular one is called Pancit Molo where cooking method is the same but the noodles used are the wonton wrappers itself. In Thailand it is also served with their version of char sui called mu daeng “red pork” and is served with garnishes like chillies preserved in vinegar, dried chilli flakes and fish sauce. How about you have you seen different variations of this noodle dish, if yes let us know through the comments below. In a pot add beef bones and enough water to cover beef bones, bring to a boil then turn heat off. Drain to remove scum then rinse bones in running tap. Place the bones back to the pot together with all soup stock ingredients, bring to a boil and simmer for 2 hours. Drain bones using a fine sieve and reserve the soup and place in a separate pot. Continue to simmer in very low heat until ready. In a separate pot add water and bring it to a boil, one boiling blanch your bok choys for 15 seconds then place in a colander and run it with cold water. In the same boiling water cook your noodles by dipping it for 10 to 15 seconds then place in a colander and run it with tap water. Place noodles, wontons, bok choy and char sui in a bowl, pour piping hot soup then add your garnishes. Serve while hot. Oh yes pls, love it. Great looking soup. And a really interesting discussion on how it’s served in different places. Super post – thanks. This is one of the prettiest noodle dishes I have seen. I’m so glad you featured a homemade beef bone broth as the base of this dish. It sounds perfect and super tasty! Your soup looks absolutely delicious! One of my favourite soups: thanks for a fabulously appetizing dish 🙂 ! I love these sorts of soups, especially when the streets are icy and the wind is cold.. I get to be warm inside with a bowl of Wonton Soup! Oh Raymund – you did it again with a wonderful stock and resulting soup! You’re putting my winter soup list together for me. I am always mesmerized by how beautiful bowl of soups layered with colorful ingredients look..
God, I have missed so many posts here, now I am drooling over every deliciousness!!! I am always so impressed with how you style your soups. They look so artistic. I’ve never had wonton soup before. In fact I don’t know that I’ve ever had wonton anything before…another new one I’ll have to try. Yum! In New York’s Chinatown it’s served with boiled won tons and some char siu. 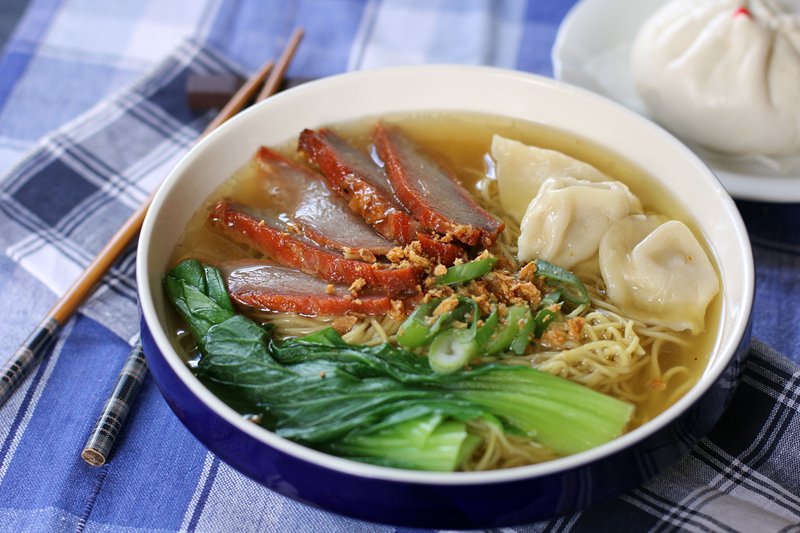 Send a few bowls of this wonton and char siu pork noodles. NOW! Wow Thank You for your kind comments. This recipe is very good! It’s also quite widespread in Vietnam under the name of “Hoanh Thanh Xa Xiu”, which is the vietnamese name of wantan charsiu mee!